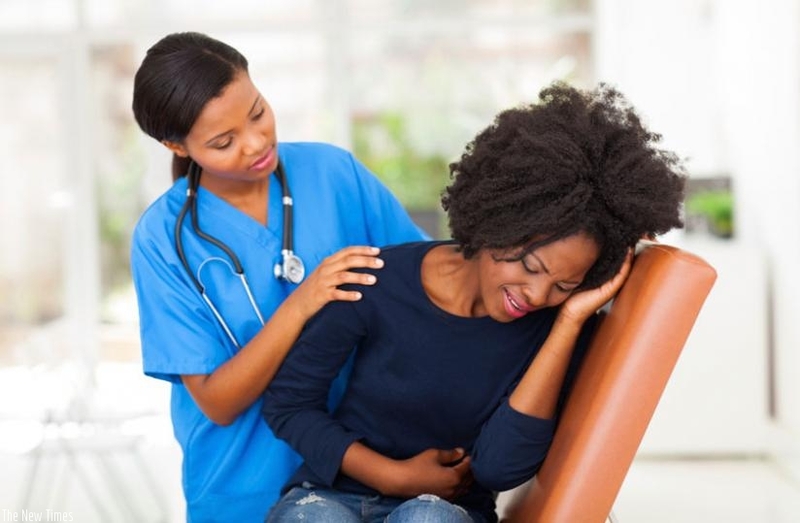 MUKONO – Menstrual cramps or period pains happen during a woman’s monthly period. The pain can be abdominal or lower back pain, headaches in some cases it causes dizziness or fainting. The time of cramping varies from woman to woman. Some women get the pain before the onset of the period, others experience it during the period while others cramp after the period. The pains lead to absenteeism at school and work and times low productivity. Mary Mayanja a student at Uganda Christian University (UCU) said that she usually falls sick during the monthly period and she has to forgo lectures for at least three days. Doctors explain that period pains happen because during menses there are contractions in the uterus or womb, which is a muscle and that causes cause the pain. “The uterus tries to expel blood from the body through contractions of the uterine walls,” explains Dr. Miriam Aguti of Mukono Church of Uganda, hospital. When the cramps are extremely painful, a condition known as dysmenorrhoea, women are usually advised to seek medical help to find out if there is another reason for the pain; as it could be caused by fibroids or infections in the uterus. For one to get quick relief, medics say it is good to take the medication as soon as bleeding or cramping starts. “When women go to the hospital requesting for pain killers we normally administer to them NSAIDS like Piroxicam, Ibruphen, Paracetamol, Mefenamic Acid, Acetaminophen, Naproxen among others,” said Dr. Emmanuel Eryenyu of Mukono International Medical Centre. “This usually helps them go through their monthly periods without feeling the discomfort,” he added. However, everything has downsides to it, although in this case those are usually ignored to deal with the pain that is at hand. “Sometimes people with ulcers may experience bleeding, some get ulcers from frequent use of pain killers, others get nausea and vomiting,” says Dr. Aguti. “They [pain killers] can reduce body immunity,” adds Dr. Eryenyu. However, there are ways one can manage menstrual cramps with non-pharmaceutical remedies, for instance, an exercise which according to research helps relieve pain. “I would recommend the use of heat through a hot water bottle placed on the stomach or a warm towel on the lower back or abdomen, drinking hot water, taking a warm bath may also provide some relief,” said Dr. Eryenyu. Dr. Aguti said that what a person eats also determines how much pain they get or not get during their menses. She says including plenty of vitamin B1 rich foods in one’s diet, for example, can greatly help regulate one’s body muscular and nervous system thus reduce or completely remove the pain. Use of herbs has become more common especially with value addition as one can easily get a pack from a pharmacy. Use of other teas other than black tea is widely recommended. Chamomile tea, Green tea, lemongrass, menthol have been said to offer some relief during the monthly period.